In the summer of 2000, when he was preparing for a seven-week cross-country bicycle trek to raise funds for the Community Foundation for Greater Buffalo, Gordon R. Gross shrugged off naysayers. "My wife and a lot of other people think I am crazy to do this at my age but, hey, I climbed to the top of Mount Kilimanjaro when I was 67," he told the Buffalo News. "It's my philosophy that the more you do, the healthier you stay. Right?" With his ride from Washington State to Maine, Mr. Gross, who was 69, raised $72,152 for the Community Foundation for Greater Buffalo. Some $54,000 of that aided the Alan J. Gross Memorial Fund, named for his late brother, also an avid cyclist, who taught in the UB Dental School. Mr. 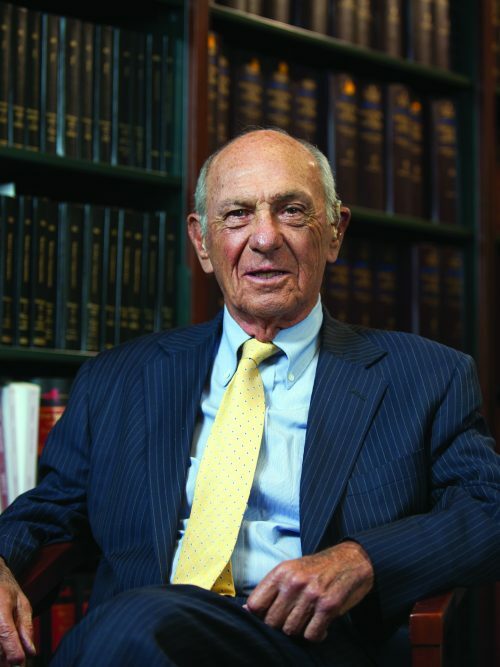 Gross, 87, a founding partner of the Buffalo law firm Gross Shuman, died March 25, 2019, in Charleston, S.C. He and his wife Gretchen Shaw Gross had spent winters on Kiawah Island for several years. Born in Buffalo, he was the son of Lester and Minnie (Kaufman) Gross. His father was a partner in a millinery factory. He grew up in Buffalo, attended Park School and Oberlin College and earned a bachelor's degree from the University at Buffalo in 1952. He graduated from UB Law School in 1955. Mr. Gross served in the U.S. Army from 1955 to 1957 as a lawyer in the Judge Advocate General Corps, stationed in Alaska. In addition to the Gross Shuman law firm, formerly Gross, Shuman, Brizdle & Gilfillan, he was a founder, trustee and officer of the Dominion Mortgage & Realty Trust from 1971 to 1982. A member of the American, New York State and Erie County bar associations, he was past member of the Fourth Department Judicial Screening Committee and a member of the Federal Merit Selection Panel for the U.S. Magistrate Judge of the Western District of New York. Mr. Gross supported many organizations, with specific interests in Jewish issues, the arts, education and health care. According to the Community Foundation of Greater Buffalo, Mr. Gross was a member of 24 boards and president or chair of 12 of them. He was a SUNY trustee from 2001 to 2008. The Grosses endowed a professorship in UB's Department of Jewish Thought, a classroom in the UB Law School is named in their honor and they made a significant gift to the UB School of Dental Medicine in memory of Mr. Gross's brother. He served on the board of advisers of the UB Department of Jewish Thought and Heritage, the Investment Committee of the University at Buffalo Foundation and its Gift Stewardship committee. UB President Satish K. Tripathi said in a statement, "For more than 60 years, Gordy was an exemplary university citizen and inspiring alumnus whose dedicated service, wise counsel and unflagging commitment to UB greatly enriched our university community, our faculty and our students." The Grosses received the 2008 UB College of Arts and Sciences Julian Park Award. He received a 1996 Distinguished Law Alumni Award from UB Law School, and, in 2010, the Samuel P. Capen Award, the highest honor given by the UB Alumni Association. Mr. Gross served on the board of Read to Succeed Buffalo and the Park School of Buffalo Foundation. He served on the Park School's Centennial Capital Campaign Committee and received the school's Alumni Service Award in 2009. He was president of the Buffalo Jewish Federation from 1982 to 1984, and won the Federation’s Nathan Benderson Community Leadership Award in 1998. He was president of the Foundation for Jewish Philanthropies from 1995 to 1997, president of Kadimah School from 1987 to 1988, and served on the board of the Bureau of Jewish Education in the 1960s and the Buffalo chapter of the Anti-Defamation League. In 1972, Mr. Gross was elected to a two-year term as president of the Jewish Center of Greater Buffalo. He was a member of the JCC national board from 1986 to 1994. A past trustee of Temple Beth Zion, he served on the board of the American Jewish Committee in Buffalo from 1988 to 1992 and co-chaired the Weinberg Campus Fund Drive in the early 1990s. Mr. Gross chaired the Community Foundation for Greater Buffalo from 1997 to 1998 and in 1995 served as chair and trustee of Kleinhans Music Hall Management. He was a trustee of the Buffalo Philharmonic Orchestra Society, the Buffalo and Erie County Library Foundation and the Westwood Country Club and chaired several divisions of the United Way of Buffalo in the 1980s. A director of the Roswell Park Cancer Institute Corporation and an avid cyclist who took up the sport at age 50, Mr. Gross was one of the all-time leading fundraisers for the Ride for Roswell. In 2010, three years after knee replacement surgery, he bicycled from Ann Arbor, Mich., to join the Ride. That year, Ride founder Mitch Flynn said Mr. Gross was one of about a dozen people who had raised more than $10,000 in a single year. "He's the top of the heap," Flynn said. Mr. Gross received the American Jewish Committee’s 1990 Community Relations Award, the 1993 Foundation for Jewish Philanthropies Award and the National Federation for Just Communities 2018 Citation Award. In 2013, the Community Foundation established the Gordon R. Gross, Esq., Award. After wearing hearing aids for 36 years, Mr. Gross had a pioneering hybrid cochlear implant that he called "wonderful for me." He served on the board of St. Mary’s School for the Deaf, chaired the Foundation for Deaf Education and received the 2008 Buffalo Hearing & Speech award. Besides his wife of 39 years, he is survived two daughters, Debra Gross Weiner and Sandra Wolchok, five grandchildren and a great-grandchild. Funeral services will be held at 2 p.m. Friday in the Sanctuary of Temple Beth Zion, 805 Delaware Ave.